We were relieved to see a scratching in Saturday's George Malone Memorial Plate at Sandown with Lord Barrington gaining a run as first emergency - in conditions that are going to suit him down to the ground. Whilst the four-year-old faces a tougher race than those he has been contesting of late, he will relish the soft conditions with his wet track form reading well. "It is a strong race," Michael Moroney conceded, "but he comes in well at the weights (54kg with the claim of Jake Bayliss) and he gets the conditions he needs." Bayliss has been riding very well for the stable of late - successful aboard Loyalty Man at Flemington last Saturday - and he has his second ride aboard Lord Barrington having been third on him at Moonee Valley last spring. The winner of three of his 21 starts, Lord Barrington has proven to be a consistent performer who has finished in the first five at each of his last five starts. On Sunday last start Wangoom winner Yesterday's Songs (pictured) is looking to make it two feature wins in a row when he contests the $80,000 Echuca Cup. Topweight in the 1400m event, the five-year-old has been kept on the fresh side since Warrnambool - "we don't do much with him in between runs, "Moroney said, "but he seems really well." 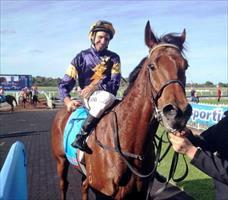 "He strikes another suitable race and gets a heavy track again. He has drawn awkwardly (18) but he is not a horse who can make good use of an inside gate anyway." "So long as he ends up in wherever the right part of the track ends up being he should again prove hard to beat." Golden Coin - first emergency in the 1600m BM64 contest at Pakenham on Sunday - is the last of our three weekend runners and we are keen for him to get a run as he has progressed nicely since his second up sixth on the turf at Pakenham a couple of weeks ago. "He strips all the fitter and he has finally drawn a gate (barrier four for Steven Arnold) so we can ride him a bit differently. He looks a nice chance in that race."